PARIS, France -- France has warned of "incalculable consequences" if the situation in Ukraine deteriorates, calling on Russia and on pro-Russian rebels in the former Soviet republic to de-escalate the crisis. Pro-Russian activists break through the gate in front of TRK Donbass television station in Donetsk. "The situation is very worrying," Foreign Minister Laurent Fabius said on French television. "When people are whipped into a frenzy and incidents proliferate, they can always boil over with incalculable consequences," he said on the eve of a meeting at which EU ambassadors will consider new sanctions against Moscow. "It's not a question of going to war with Russia, that makes no sense. We must appeal for a de-escalation, in particular by the Russians and the pro-Russians" in Ukraine, he added. Mr Fabius said: "Obviously we have to say, in particular to the Russians, that each country's sovereignty must be respected. We respect Russian sovereignty the Russians should respect Ukrainian sovereignty." The French minister said that ambassadors from the European Union's 28 member states meeting in Brussels tomorrow will "prepare a new set of sanctions (against Moscow), the Americans are expected to reveal a new set of sanctions, and if things get even worse, there could be a third phase". Meanwhile, pro-Russian separatists seized control of the offices of regional state television in the eastern Ukrainian city of Donetsk, a Reuters reporter outside the building said. The reporter said four separatists in masks, with truncheons and shields, were standing at the entrance to the building controlling access, while more separatists in camouflage fatigues could be seen inside. Earlier, just one of eight Organization for Security and Co-operation in Europe inspectors held by rebels in the eastern Ukrainian town of Slaviansk has been released. Two negotiators and the freed Swedish military inspector boarded a white car with an OSCE logo on it and drove away without any comment to reporters. Earlier in the day the leader of the international observers detained by the pro-Russian separatists said that all the group were in good health. However, he added that they were anxious to be allowed to go home soon. 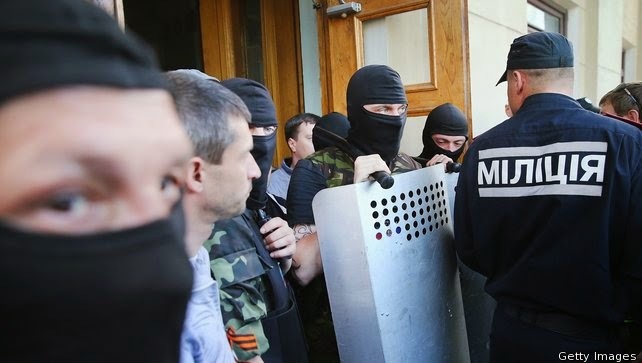 Appearing in public for the first time since they were held three days ago, seven officers from the observer team and their translator were brought into a room of waiting journalists in the separatist-held city administration building. Guards in camouflage fatigues and balaclavas, carrying Kalashnikov rifles, were also in the room as journalists spoke to the observers. Colonel Axel Schneider, who was leading the observer mission, said the group came to Slaviansk without weapons and were there strictly in line with their mandate under OSCE rules, to carry out military verification work. "We were accommodated in a cellar. We had to set up conditions for ourselves," said Col Schneider, describing what happened after they were seized. "Since yesterday we've been in a more comfortable room with heating. We have daylight, and an air conditioner." Col Schneider, who had a shaven head, a closely-cropped beard and was wearing a plaid button-down shirt, told reporters he had "not been touched," and that there had been no physical mistreatment of the group. The group sat side by side at a long table in front of the reporters, looking sombre and serious, but otherwise well. "All the European officers are in good health and no one is sick," Col Schneider said. He said the separatist de factor mayor of Slaviansk, Vyacheslav Ponomaryov, had guaranteed the group's safety. He said he believed the mayor's promise. Mr Ponomaryov appeared with the detained men at the news conference. "We have no indication when we will be sent home to our countries," Col Schneider said. "We wish from the bottom of our hearts to go back to our nations as soon and as quickly as possible." Elsewhere, two OSCE monitors were held briefly at a checkpoint in eastern Ukraine before Ukrainian police secured their release, a spokeswoman for the pan-European security body said. "Two team members were held for a short time at the administrative building there. Local police units made it possible for the two members of the monitoring mission to leave the building unharmed," the spokeswoman told AFP. The incident happened at the Yenakyeve checkpoint near Donetsk. The two are part of a Special Monitoring Mission run by the OSCE currently comprising 122 civilians based in 10 locations plus local staff. Earlier today, US President Barack Obama said new international sanctions set to come into force against Russia would send a message that it must stop its "provocation" in eastern Ukraine. "It is important for us to take further steps sending a message to Russia that these kinds of destabilising activities taking place in Ukraine has to stop," Mr Obama said at a press conference in Malaysia. He was speaking a day after G7 nations said that they would impose new sanctions on Russia within days, accusing the government in Moscow of doing nothing to honour an agreement forged in Geneva aimed at easing tensions in Ukraine. "So long as Russia continues down a path of provocation rather than trying to resolve this issue peacefully and de-escalate it, there are going to be consequences and those consequences will continue to grow," Mr Obama said. Ukrainian Prime Minister Arseny Yatsenyuk claimed Russia had violated his country's airspace seven times overnight Friday with an aim "to provoke" Ukraine into starting a war. US Secretary of State John Kerry told his Russian counterpart Sergei Lavrov that Washington was concerned about "provocative" troop movements along Russia's border with Ukraine and its support for the separatists, which he said "are undermining stability, security and unity in Ukraine". Mr Yatsenyuk cut short a visit to the Vatican as concern grew that the tens of thousands of Russian troops conducting military drills on the border could soon be ordered to invade. But Russia denied any transgression by its warplanes, with Mr Lavrov calling for "urgent measures" to calm the crisis, which has plunged East-West relations to their lowest point since the Cold War. A Western diplomat warned: "We no longer exclude a Russian military intervention in Ukraine in the coming days." The diplomatic source noted that Russia's UN envoy, Vitaly Churkin, "has been recalled urgently to Moscow" for consultations.